EV's influence on global gasoline and diesel consumption is small but is increasing quickly. This short presentation aims to show BNEF's assessment of the fossil fuel displacement caused directly by EVs sold globally from 2011 to 2016. Global sales of plug-in electric vehicles are growing quickly, up 55% in 2016 compared with 2015. Although still small, their influence on gasoline and diesel consumption volumes is steadily rising. Oil displacement values caused by EVs will vary regionally and will largely depend on the average miles travelled and the fuel economy of the ICE vehicles they are displacing in a given country. However, using global weighted average values of these two variables, EVs displaced 77% more oil in 2016 than in 2015. 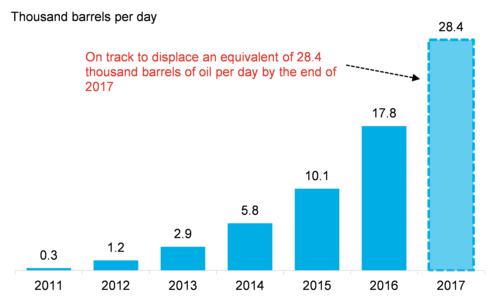 EVs are displacing 17.8 thousand barrels of oil per day as of the end of 2016. We expect global annual EV sales to increase further by 39% in 2017 and increase their fuel displacement values by 60% as BEVs are becoming more popular.